Are you a lumberjack? Do you haul peat from bogs, or otherwise labor in cold, wet, physically exhausting conditions, day-in-day out? If so, you’ll find exactly the sort of hearty, hot and, above all, calorie intensive repast you need to keep going in Trader Joe’s Steak and Ale Pies. Worth it: Yes… if you can spare the calories. These dense cylinders of dinner are the classic English version of the more familiar American chicken-pot pie. The box contains two meat stew-filled “pies”, bottled up inside thick, but buttery and flaky crust. 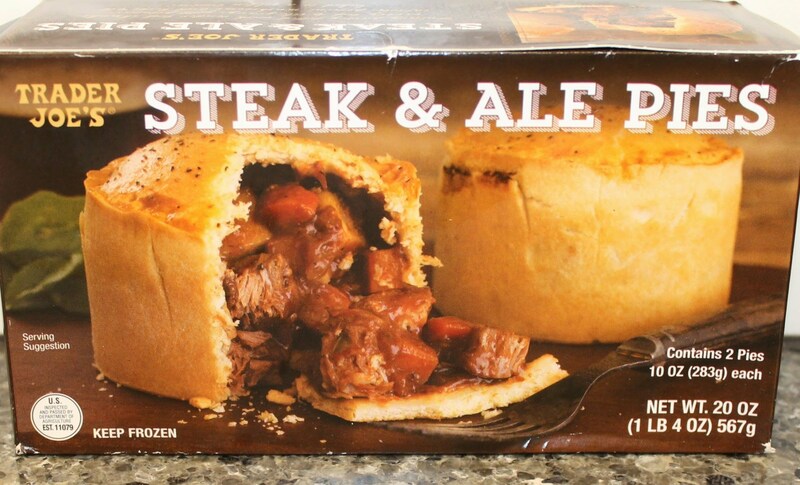 A few things set these steak and ale pies apart from traditional pot-pies – the first among them being the ale. The “ale” in the product name isn’t just an idle threat – TJ’s has actually stewed up each of their pies with strong, stout beer. It’s an addition you can certainly taste, and it gives each pie a dark, slightly bitter bite tinged with the distinctive taste of a strong porter. That’s not a taste that might go well with jut any pot-pie, but Trader Joe’s does well by it by going heavy on the steak and thick gravy filling. This thick, meaty taste pairs well with the ale edge, conjuring up a warm culinary sensation of coming in from a cold autumn dusk, stomping off your boots, and hunkering down by a roaring hearth. TJ doesn’t limit himself to just steak and ale, however, also throwing in potatoes, carrots, celery and onions to make up a mighty hearty stew. Of course, if I’d wanted a stew, I would have bought a stew. Like Trader Joe’s other pot-pies these really triumph on the strength of their delicious, buttery crust. Unlike the more common American pot-pie, these Brit-inspired creations are entirely surrounded by tasty, crunchy crust. Thick enough to stand up to manhandling on the plate, the crust is also light and savory enough that eating your way through it to the piping hot core is a delight, not a chore. Of course, the words “buttery” and “hearty” don’t usually get thrown around with the word “fattening” also, and it’s no different here. This is not the frozen dinner to pick up if you’re watching your waist line. Just one 10 oz. pie contains 670 calories, a whopping 63% of which is pure fat. Of the 41 grams of fat in a single pie, 24 grams are saturated fats (120% your daily recommend value) and – even worse – 0.5 grams come from universally reviled trans fats. And even in the face of all that, after eating one of the pies, I was left sitting there hungry. 10 ounces of anything does not a meal in itself make. If you’re not a deep sea crab fisherman or professional bear wrestler and still decide to pick these up, make sure to get some salad greens and a light vinaigrette for the side. Would I Recommend Them: Yes, but be prepared to feel diet guilt. Would I Buy Them Again: Sure, the next time I’m gearing up for a all-night forced march. Final Synopsis: Tasty English-style pot pies with a massive fat content. Yes, I love the pies, but when are you going to stock them again? Your staff keep saying “soon” but what does that mean? Colombo Joe would be horrified at your lack of production of such a valued item. Yes, yes, yes!! I miss my pie. When, oh when will it be back?? Got one last week at my local TJ in LA. I have asked several times,when are these pies going to come back on the shelves. Each time, they say “soon”, and they are trying to get a new contract with the supplier. Who is the supplier, because I’d like to buy some from the supplier myself. I have had the same reaction from TJ’s staff. You start to wonder what is really the problem. I love those pies so I hope TJ’s does something soon.